Considered as one of the most beautiful buildings of the world and the iconic symbol of India, the Taj Mahal is actually a mausoleum built in the 17th century by a Mughal emperor in memory of his favorite wife. We never imagined being able to visit it in our lifetime but during a trip to Katmandu, Nepal for a meeting a few years ago we had a stopover in New Delhi, India. Our Indian friends suggested we visit the Taj in the city of Agra, Uttar Pradesh since it was just four hours drive from New Delhi. The tomb of Akbar the Great in Sikandra near Agra. Naturally we didn’t need any second bidding for the chance to visit one of the most recognizable and famous architectural wonders of the world. The trip to Agra took us through farm fields and small cities via the excellent national highway. Just before Agra city proper we stopped at the suburb of Sikandra to visit the Tomb of Akbar the Great, a 16th century Mughal emperor. (The Mughals were descendants of the Timurids, who controlled most of the Indian subcontinent from the 16th to 18th centuries.) 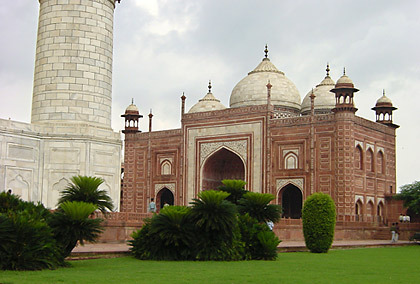 Built in red sandstone with white marble features, this mausoleum predates the Taj Mahal. The curious thing about this structure is that its eventual occupant, Akbar the Great himself, planned it and chose the site. Memorial plans were probably unheard of back then but we’ve learned that this is Tartar tradition after all. Shades of Akbar the Great’s tomb: the Great gate (Darwaza-i rauza) or main entrance to the Taj Mahal is also built of red sandstone with white marble features. We arrived at Agra just in time for lunch. Looking around the city we decided to dine at a restaurant serving Mughal cuisine with our Indian companions. It turned out to be the most memorable (and formidable) Indian meal we’ve ever had with seven different types of nan bread and various types of mutton, chicken and vegetable curry. We were so stuffed from that meal we did not eat for the rest of the day and had a very light breakfast the following morning. With its imposing white marble architecture and intricate decorative elements, the Taj Mahal is truly an architectural wonder. Still reeling pleasantly from that culinary encounter we went on to see the Taj Mahal just a short ride away. The white marble tomb topped by a dome and surrounded by four 130-foot minarets at each corner of its square base foundation is easily the most popular feature but the Taj Mahal is really a complex of buildings with the tomb or mausoleum as its central focus. 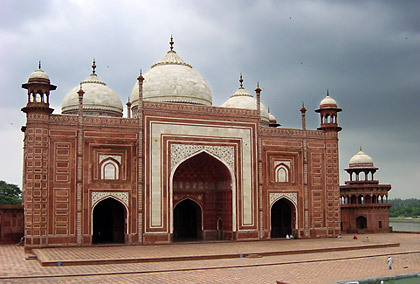 Most of the structures are made of red sandstone with white marble features such as the Great gate (Darwaza-i rauza), a masjid or mosque on the western end of the tomb and a jawab whose main function is to ensure symmetry of the whole structure but might have been used as a guesthouse as well. The complex is set on a huge 300 square meter garden with a reflecting pool. The Taj Mahal may not look as imposing on photographs to the casual observer but once you get to experience it personally, the 82 foot high interior walls and 115 feet high dome – all made of white marble with intricate decorations including bas-relief, calligraphy and extremely delicate inlays in semi-precious stones – will overwhelm you. One of the two red sandstone buildings on the east and west wings of the white marble mausoleum. There’s a bit of romance – and tragedy – behind the Taj Mahal’s construction. The Taj was built by the emperor Shah Jahan in memory of his third and favorite wife Mumtaz Mahal who died while giving birth to their 14th child. According to accounts Shah Jahan was so taken by Mumtaz Mahal that her death brought much grief to the emperor. Construction of the Taj Mahal started in 1632 and eventually involved about 20,000 workers before its completion 21 years later. A short time thereafter, Shah Jahan was overthrown by his own son Aurangzeb and imprisoned in the nearby Agra Fort. When he died, Aurangzeb had him buried in the mausoleum near Mumtaz Mahal. The Indian government goes to great lengths to preserve the Taj. Sadly the white marble is taking on a yellowish color due to pollution in the area. The government has set-up strict emission controls to curb this problem. A good number of people are also involved in regular repair and maintenance work. During our visit we overheard a tour guide claiming that a group of artisans and craftsmen at work in the compound were actually true descendants of the workers that Shah Jahan had originally employed to build the monument in the 17th century. We smiled as we walked away thinking the guides were just spinning some tall tales. However a recent documentary on the Taj Mahal showed craftsmen doing repair and restoration work using techniques learned from their ancestors who were the original builders of the Taj Mahal. It seems that guide was not drumming up a fairy tale after all. 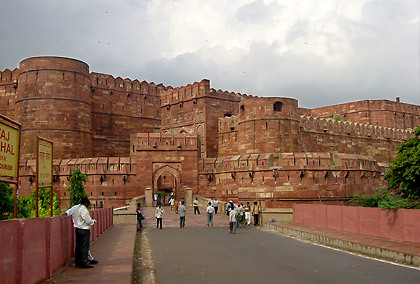 The Agra Fort is one of the three UNESCO World Heritage sites in Agra. The Taj Mahal is not the only historical site in Agra. Because the city was once the capital of the Mughal Empire, many ancient structures abound here. 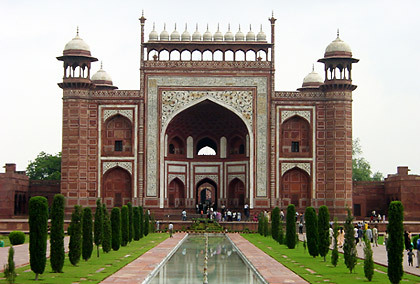 Besides the Taj Mahal there are two other UNESCO World Heritage Sites in Agra. 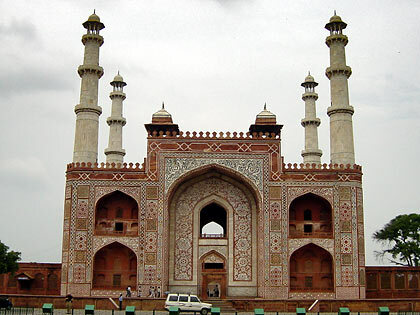 We already mentioned the Mausoleum of Akbar the Great in the suburb of Sikandra. The third heritage site is situated just 2 kilometers from the Taj Mahal: the Agra Fort, sometimes called the Red Fort because of the red sandstone material used for its construction. Akbar the Great started the construction of the fort but it was Shah Jahan, his grandson and builder of the Taj Mahal, who finished his soon-to-be prison cell. Shah Jahan would spend the last eight years of his life as a prisoner of his own son (the emperor) Aurangzeb inside the Agra Fort. Without a doubt he would have often cast a gaze over the Yamuna River to the white, onion-domed marble architectural wonder that was his wife’s – and eventually also his - final resting place. 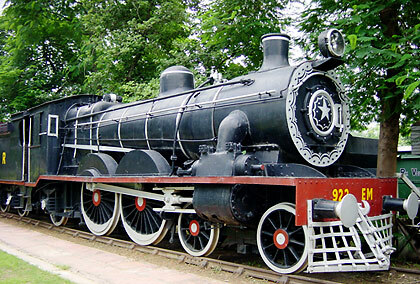 A train on display at the National Rail Museum, New Delhi. Traveling back to New Delhi that same evening, we were still full from the culinary and visual feasts that greeted us in Agra. We would spend some more time in New Delhi on the return trip from Katmandu to visit the Indian Parliament, see the National Rail Museum and try out still more Indian food. But nothing beats the experience of seeing the Taj Mahal from up close and going back in time to the tragic story of an emperor and his beautiful empress. Submitted by Baisakhi Festival on Fri, 07/15/2011 - 08:51. 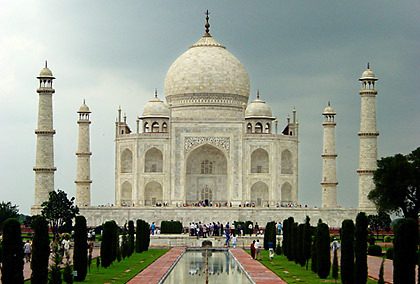 True, Taj Mahal is the great monument of the India made up of white marble situated near the Yamuna river, in Agra. 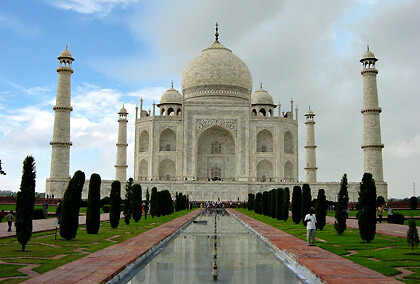 It is great wonder of the world, tourist across the globe, come to Agra and visit this great wonder.